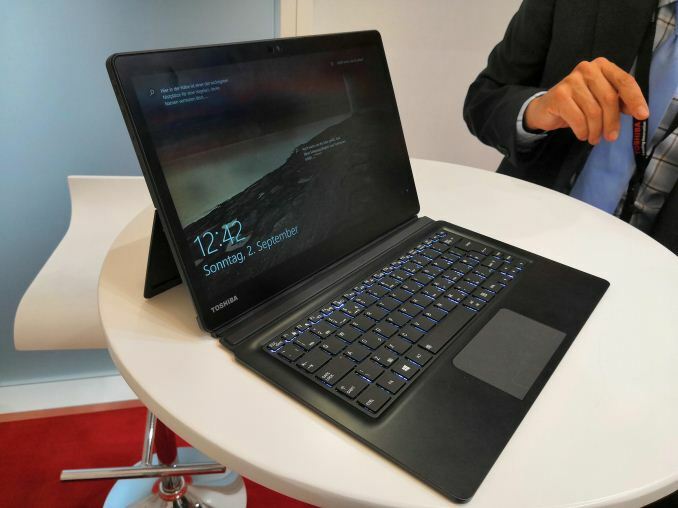 Back at the IFA event in Germany, I noticed that Toshiba had announced a new laptop. However the headline didn’t quite grab my eye. 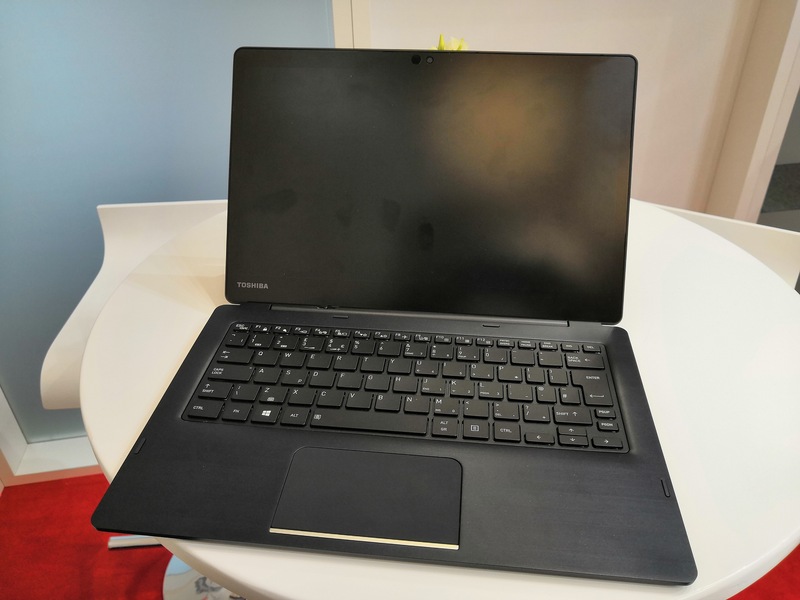 It was only by chance that while walking through the show floor, I stumbled into the Toshiba booth where the device, called the Portégé X30T, was on display. 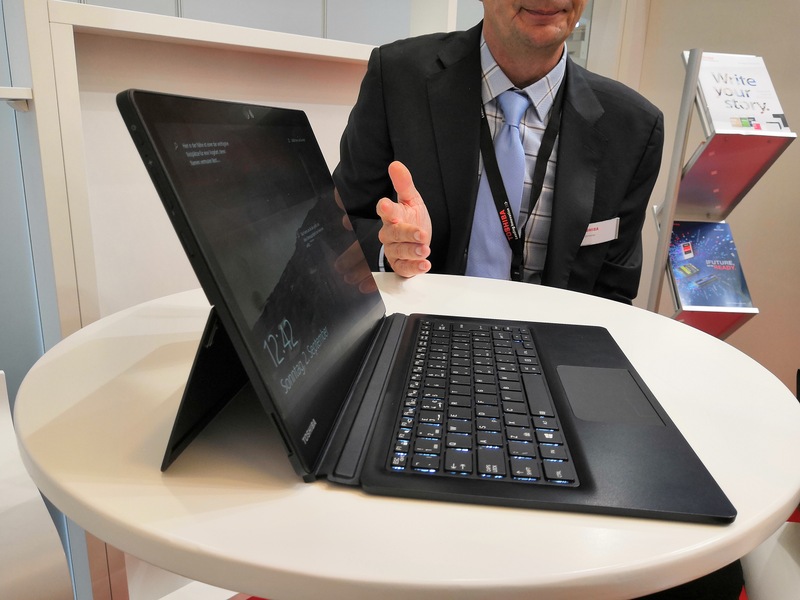 When I say it is an uncanny mix of clamshell and tablet, this is not an exaggeration: trying to tap into that Thinkpad market is difficult, and Toshiba thinks this new device is one to fit into the bill. Toshiba lists the Portégé X30T as ‘a business companion that’s built to move’. 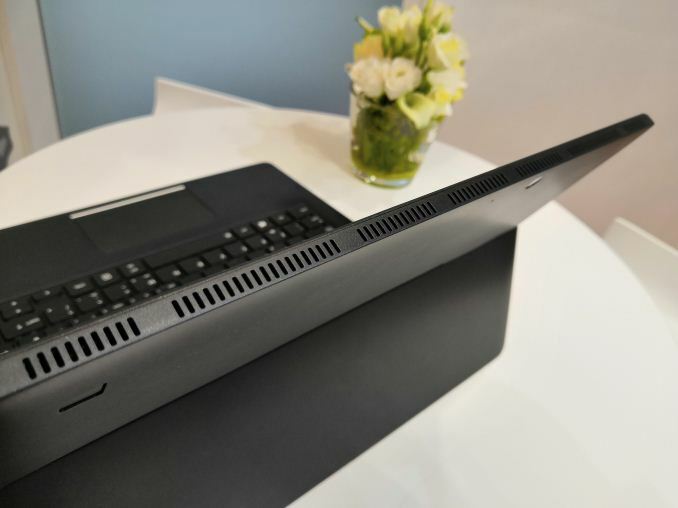 And if you take a quick glance at the fully-assembled device, then you'd say it looks like any other laptop, with a large high quality screen, a keyboard with ports, a hinge, and that should be the lot. However the Portégé X30T is more like a conventional 2-in-1: the keyboard – with houses the USB ports, VGA output, HDMI output, and Ethernet port – detaches. The unit physically detaches with two metallic hooks to reveal a USB-C connection between the keyboard and the screen, but all the internals are housed in the screen. Those internals include a 15W class Intel processor with integrated graphics, storage and memory, but also a back hinge for the device to stand up like most 2-in-1 devices when the slim keyboard is used. The full-fat keyboard, with an extra battery and ports, makes the system stable enough to be a clamshell; but users can invest in a light weight keyboard for the device to be more portable. The slim keyboard by contrast uses a simple pogo-pin type interface. But that being said, even with the full-fat keyboard, I felt the overall design was still fairly light – it was actually the first thing I said to the rep when they handed me the unit. Inside the screen is an 8th generation U-series processor, a 13.3-inch FHD touchscreen display with active pen support, the built-in kickstand, both front-facing and rear-facing cameras, and Toshiba states that it is around 0.9 inches thick and weighs under 1kg. The base tablet mode should be good for eight hours of battery life, but the full-fat keyboard bumps that up to 14-15 hours. Toshiba is offering a 3-year warranty for the laptop, and it is built to the MIL-STD-810G standard for durability. Compared to the previous generation, it would appear that the in-keyboard trackpoint is now an optional extra (for business users that prefer it), and Toshiba has bumped the device up from a 5W Core M to a 15W U-series processor, which requires additional vents in the tablet part of the device. 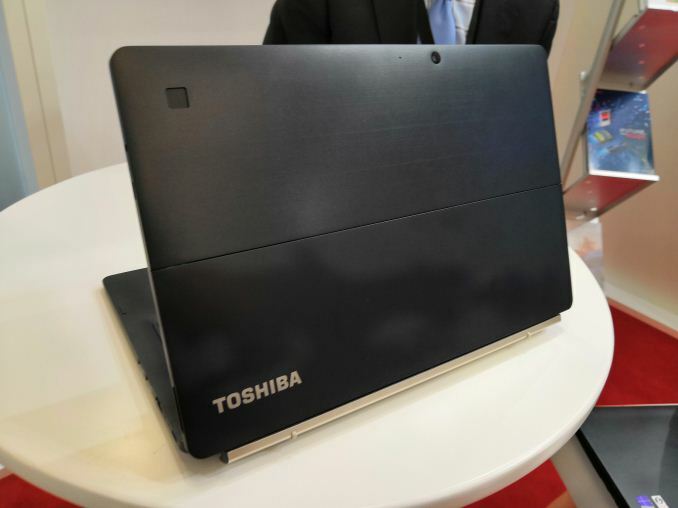 Toshiba is set to make the newest Portégé X30T available in October, starting at $1550. To be honest, my main critique with 2-in-1 devices is that I use my main portable notebook in clamshell mode at critical parts of my job – either on tiny tables on airplanes, or on my lap during keynotes. This is where the 2-in-1 model falls apart: it requires an additional ‘stand’ which takes more room that I don’t have. By having a weighty keyboard that also adds a lot of battery life, Toshiba has a good thing going here. If I know I’m going to be doing desk work, I can potentially use the lightweight keyboard at all other times. I think that should be "most" for 2-in-1. Many 2-in-1 do not require a kick stand. My T100HA does not. That said, I've finally decided that weight is my primary issue and less size. So I will probably be looking for something like an Asus UX390 when I finally replace my T100. It would be nice to see some competently designed small form factor laptops with something like a 4415y in them. The Surface go is nice, but makes compromises to be a tablet (and also not cheap by the time you add the type pad and configure with 8/128GB). The 11.6" market seems to have mostly evaporated, or is only cheap chrome books. But a thin and light 11.6" with a 4415y in it, 8GB of RAM, 128 or 256GB SSD and either 180 degree hinge or just standard hinge would be awesome.